Do you love or would you love to getaway to beautiful Steamboat Springs, Colorado and enjoy skiing and relaxing in the mountains? I absolutely love traveling to the mountains but I have never gone during the winter months. I have actually never even gone skiing but I would love to learn! A ski vacation or weekend get-a-way to Steamboat Springs is bound to be filled with powder skiing and genuine western hospitality, but not many visitors expect the luxurious experience offered by the Highmark Steamboat Springs. Located across the street from the Steamboat gondola, the Highmark offers 16 exclusive vacation rental condominiums in a boutique hotel environment. Each vacation residence is furnished in lavish mountain style with sandstone fireplaces, jetted tubs, sumptuous gourmet kitchens, and elegantly rustic appointments. The amenities are exceptional with an indoor-outdoor heated pool, outdoor hot tub, ladies’ and men’s individual steam rooms, locker rooms, showers, and a private fitness club with state-of-the-art equipment. And if you’re traveling with kids, the guest lounge features a game room with gas fireplace, large high-definition TV, and game tables. You’ll feel pampered and indulged under the attentive eye of the guest services team. From complimentary local shuttle service, to activity and dining planning, to convenient ski valet, all requests are encouraged and nothing is overlooked. If you don’t believe me, just check out TripAdvisor. Highmark Steamboat is rated #1 in Specialty Lodging in Steamboat Springs with a near perfect ‘Excellent’ traveler rating after over 100 reviews. 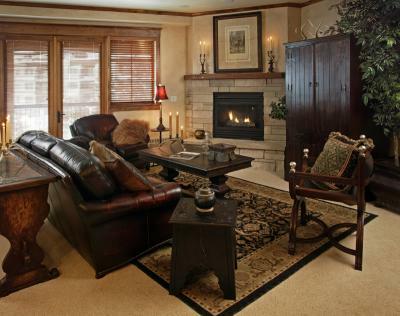 Save on Mountain Lodging up to 30% on a stay of 3 nights or more this winter at the luxurious Highmark Steamboat Springs vacation rentals. Or call 877-879-6555 for personalized service. The lodge looks absolutely beautiful.I love traveling but have never been up in the mountains to ski either.It does look like a lot of fun though. Wow! The lodge looks beautiful! I love to ski – but I haven’t been in a while.